There's a star about 8,500 light-years away that's spinning so fast its surface speed exceeds 620,000 mph. Astronomers are familiar with these kinds of stars, but this one's wholly unique in that it has a rather strange companion: a black hole. To date, astronomers have catalogued more than 80 of these Be type stars. They're typically members of a binary system, with the companion being a neutron star (collapsed stars that aren't big enough to form black holes). Amazingly, Be stars can spin at these horrendous speeds without breaking-up, producing huge centrifugal forces. A detailed analysis of its spectrum allowed scientists to infer the characteristics of its companion. "It turned out to be an object with a mass between 3.8 and 6.9 solar masses," said Ignasi Ribas of CSIC at the Institute of Space Sciences. "An object like that, invisible to telescopes and with such large mass, can only be a black hole because no neutron star with more than three solar masses can exist." The black hole orbits the more massive Be star and is fed by matter ejected from the latter. 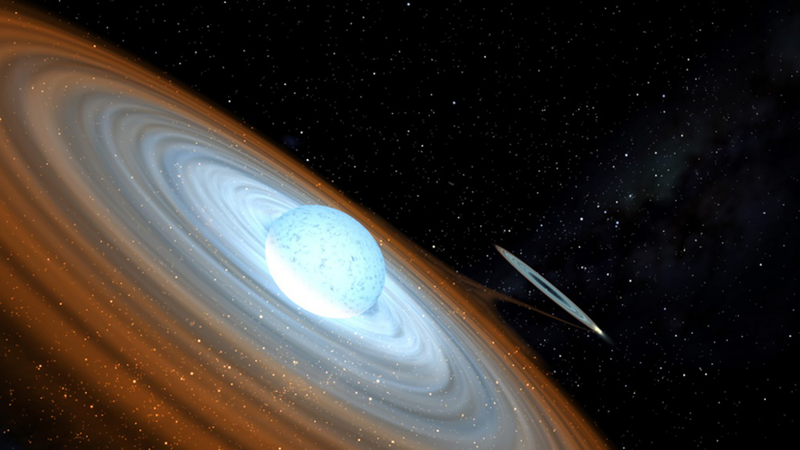 "The high rotation speed of the Be star causes matter to be ejected into an equatorial disk," said Ignacio Negueruela at the University of Alicante. "This matter is attracted by the black hole and falls on to it, forming another disk, called an accretion disk. By studying the emission from the accretion disk, we could analyze the motion of the black hole and measure its mass." The astronomers think it's a member of a hidden population of Be stars paired with black holes and that they're more common than previous thought. Unfortunately, they're hard to detect because their black holes are fed from gas ejected by the Be stars without producing much radiation. Top image: Gabriel Pérez - SMM (IAC).